Our product range includes a wide range of fiber marking machine. With the help of our competent of professionals and state-of-the-art infrastructure facilities, we are able to offer precision engineered Fiber Marking Machine. Known for its high accuracy, faster processing and flexible method of marking this type of machine is used to mark different barcodes, logos, serial numbers, and images. 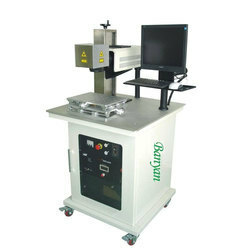 In adherence to their needs, our patrons can purchase the fiber marking machine in various technical specifications.